It’s the most wonderful time of the year. 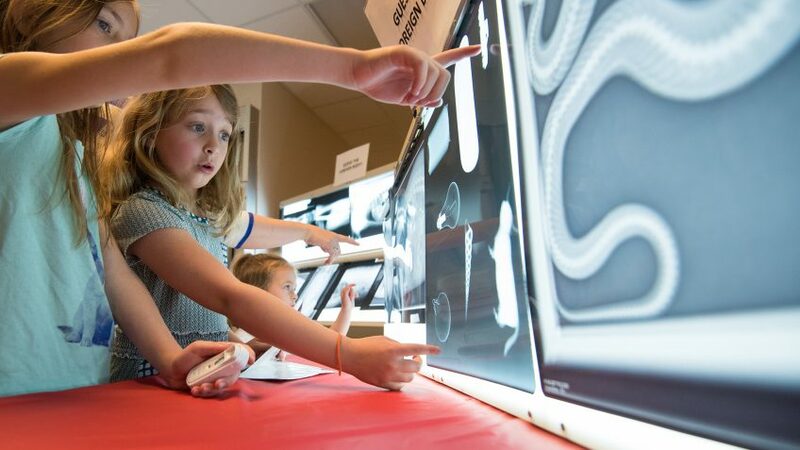 The NC State College of Veterinary Medicine’s Open House is a chance for us to welcome a community we feel so honored to serve — and share everything that makes us so unique. On April 1, you can get a behind-the-scenes look at how we train the best and brightest at one of the top academically ranked veterinary schools in the country. 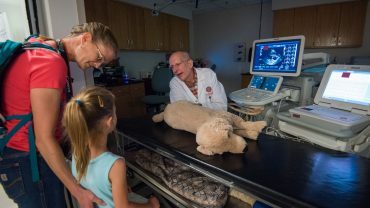 Take a tour of the Terry Center, one of the nation’s largest and most advanced veterinary hospitals, and learn about services ranging from oncology and cardiology to neurology and orthopedics. And there’s cow milking and face painting. Tours de force: Everyone is free to explore many areas of campus on their own, but for a truly informative behind-the-scenes experience join one of the many tours scheduled throughout the day. During the Terry Center tour, you can see many of our hospital’s innovative services at work, including cardiology, neurology, radiology and oncology. The thorough college grounds tour boasts more than two dozen stops — and is packed with special events, demonstrations and information booths. And over at the research building tour, learn about how we’re at the forefront of a new frontier of veterinary medicine, with groundbreaking work in regenerative medicine, genomics, infectious disease and cancer. Tail wagging: Missed our Dog Olympics last September? Here’s a mini version. At 9 a.m. and 9:30 a.m., the State Bureau of investigation will hold K9 demos (it’s worth getting here early for it), followed by showcases from the American Kennel Club (10:30 a.m. and 12:30 p.m.) and treibball agility (11:30 a.m. and 1:30 p.m.). Hands-on experiences: You’ll have a lot to choose from. Outside, the college’s Bovine Club can help you milk a cow. In Room D232, check out various amphibians, reptiles and fish. And in the microscope lab, you can learn from students how veterinarians diagnose disease. 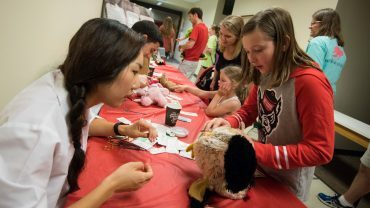 One of our favorites: The Surgery Club hosts a teddy bear clinic, where future vets can stitch up their bear’s wounds in Blue Commons. It’s as cute as it sounds. Surgery, stat! 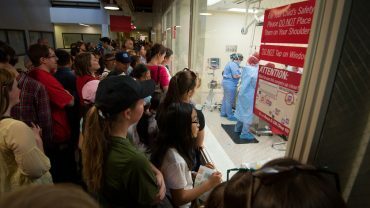 : For an even more eye-opening experience, the South Theater’s live broadcasts of surgical demonstrations at 10 a.m. and 1 p.m. provide one-of-a-kind glimpses into the CVM’s day-to-day life-changing work. 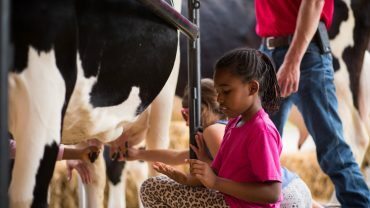 In between surgical broadcasts, budding vet students and their families can take part in discussions with our admissions committee at 11 a.m. and 2 p.m.
Large and in charge: Throughout the day, large animal demos reflect our devotion to equine care and rehabilitation. Among the options: horseshoeing showcases (9:45 and 10:45 a.m.) and mustang demos (1 and 2 p.m.) And in the outdoor corral, mares and foals will be on view all day, along with physical exam demonstrations. 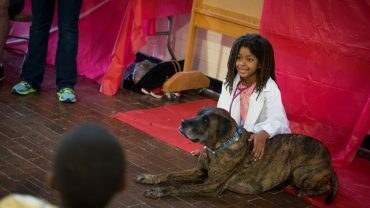 Information, please: If you or someone you love is interested in becoming a veterinarian, head to North Theater, which will feature talks on veterinary medicine careers (10 a.m.), rehab presentations (11 a.m. and 1 p.m.) and the intriguingly titled “Be a Vet for a Day” (2:30 p.m.). Time to unwind: In need of a bit of a rest during Open House? Head to the library, where you can have your pick of animal books or videos to explore, draw your favorite animal, observe a 3-D printer in action or check out virtual horse or dog anatomy. And you can also take a lunch break with a variety of food truck offerings and — our favorite — Howling Cow Ice Cream, made right here at NC State. Exciting, right? It’s just scratching the surface. For a full rundown of activities and events, as well as a campus map, go to cvm.ncsu.edu/open-house. See you April 1!